As you research HVAC components to consider for your home, you’ll see that each one has an energy-efficiency rating. 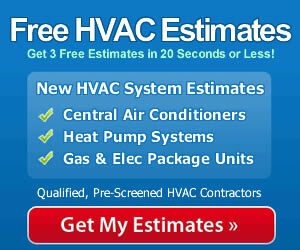 HVAC ratings tell you how well the component turns energy into heating or air conditioning. In this HVAC guide you’ll learn what each of the HVAC ratings stands for. We also list Energy Star requirements and provide a range of efficiency levels currently available. Gas and Oil Furnace AFUE: The HVAC rating for gas and oil furnaces is designated AFUE. This stands for Annual Fuel Utilization Efficiency and summarizes how efficient a furnace is over the course of an entire heating season. The rating measures how much of the heat created by the furnace burner goes to heat the home and how much of it is lost along with the exhaust gases. In an 80% AFUE furnace, 80% of the heat goes into the home and 20% is wasted. Today’s furnaces must be at least 80% efficient according to government regulations. Every manufacturer makes at least one 80% efficient furnace. Since they are relatively inexpensive, they can be a cost-effective choice in warm climates where the furnace isn’t heavily used. Higher efficiency furnaces range from 90% AFUE to 98% AFUE. Most high efficiency furnaces use a second heat exchanger to transfer as much heat as possible out of the waste gases before they leave the furnace through the vent. To be Energy Star qualified, the AFUE for a gas furnace must be at least 90%. For an oil furnace it must be at least 85%. The HVAC ratings for air conditioners reflect how efficiently they turn electricity into cool air. While electricity can be more expensive to heat with, air conditioners as well as heat pumps take advantage refrigerant to maximum their efficiency. Because refrigerant absorbs heat so quickly and also shed it easily, one unit of electricity can be turned into 3-5 units of heating, depending on the efficiency of the product. In a space heater, one unit of electricity can produce just one unit of heat. SEER stands for Seasonal Energy Efficiency Rating. It measures the cooling efficiency of the unit over the entire cooling season. The total amount of cooling is divided by the total number of watt-hours of electricity used. The EER is the Energy Efficiency Rating and measures the steady-state cooling capacity of the unit. Today’s central air conditioners must be at least 13 SEER models while the most efficient currently available have SEER ratings in the mid-20’s. To be an Energy Star product, the SEER must be 14.5 for split system ACs and the EER must be 12. For package unit air conditioners, the SEER must be 14.0 and the EER 11. Heat pumps are measured in SEER and EER for cooling and have the same Energy Star requirements as central air conditioners. For heating, HSPF is used, which stands for Heating Seasonal Performance Factor. Like SEER, it measures energy efficiency over an entire system. Total Btu’s (British thermal units) produced is divided by the total number of watt-hours of electricity used. As you shop for heat pumps, you’ll find models ranging in HSPF from about 7.5 to 13. To be Energy Star qualified, a split system heat pump must have an HSPF of 8.2 while a package unit heat pump must be 8.0 HSPF. Here’s a summary of the HVAC ratings for equipment as well as Energy Star requirements. Gas and Oil Furnaces: AFUE or Annual Fuel Utilization Efficiency. Energy Star: 85% for oil furnaces, 90% for gas furnaces. Air Conditioners: SEER or Seasonal Energy Efficiency Rating; EER or Energy Efficiency Rating. Energy Star: 14 SEER/11 EER for package units, 14.5 SEER/12 EER for split system air conditioners. Heat Pumps: SEER/EER and HSPF or Heating Seasonal Performance Factor. Energy Star: 8.0 HSPF for package units, 8.2 HSPF for split system heat pumps.